About tuber sizes: All packets contain two tubers. 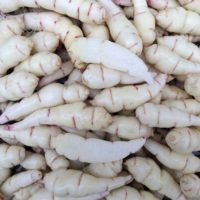 Tuber size varies considerably from packet to packet. Often we will include a larger tuber and a smaller one. As we get toward the end of our supply, they may all be small. Tuber size really doesn’t matter much, but if you are worried that a tuber is too small, start it in a pot and plant it out once it is about six inches tall.